W związku z wprowadzeniem do sprzedaży dwóch nowych tytułów, przy zakupie dwóch książek wysyłki okonuję na swój koszt.! the oldest Polish bridge magazine (from 1956). I was engaged in editing of it many years. Here you can find some materials from old issues. I was tempted to start the editing activity by many years of cooperation in editnig "BRYDŻ" - the oldest Polish bridge magazine. I was also editor of the bulletins at many tournaments and I have written some books. ("Competitive Bidding", "Bridge for everybody". 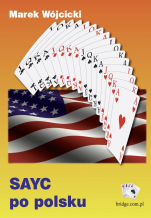 In 2007 I have received the International Bridge Press Association prize for the article on the declarer play of the year 2006 (Alfredo Versace hand from European Team Championships). 11.05 - Warszawa - wielkie święto brydża! Już w sprzedaży remake klasycznej "Szkoły wistu"
Promotion - free delivery inside Poland! 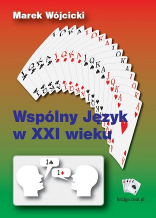 I have started selling a book - "Bidding Standard of "BRYDŻ" Polish Club at XXI Century". Delivery inside Poland gratis. I am preparing the book "Who is who in Polish bridge"... If somebody is interesting, please, send me short note with profile, concerning not only the bridge, but also some personal data.